This beautiful display of all-white foxgloves is courtesy of my friend Keven Hawkins. He purchased these beauties at Boxwoods in Atlanta, Georgia, and planted them in his garden in Cashiers, North Carolina. I love how they brighten this otherwise dark corner. A white garden is magical at sunset—it lights up the evening like candlelight. Think of the white garden at Sissinghurst. Did you know that Vita Sackville-West and Harold Nicolson actually called their world-famous garden the grey, green and white garden. Have a wonderful weekend—head to the garden center for white plants! So beautiful…wishing I was going to be spending my weekend in your weather – 96 here tomorrow…Happy weekend, Lissy! Wow—I hate the heat. It is 73 here! White is wonderful! Sissinghurst white garden is testimony for that. Have decided it is the best for hot climate places as it makes you feel cooler and yes in the moonlight! Moonflower vine is a great addition for fragrance. Like the ground covering foxgloves in cluster….very appealing. I am definitely planting more white flowers. 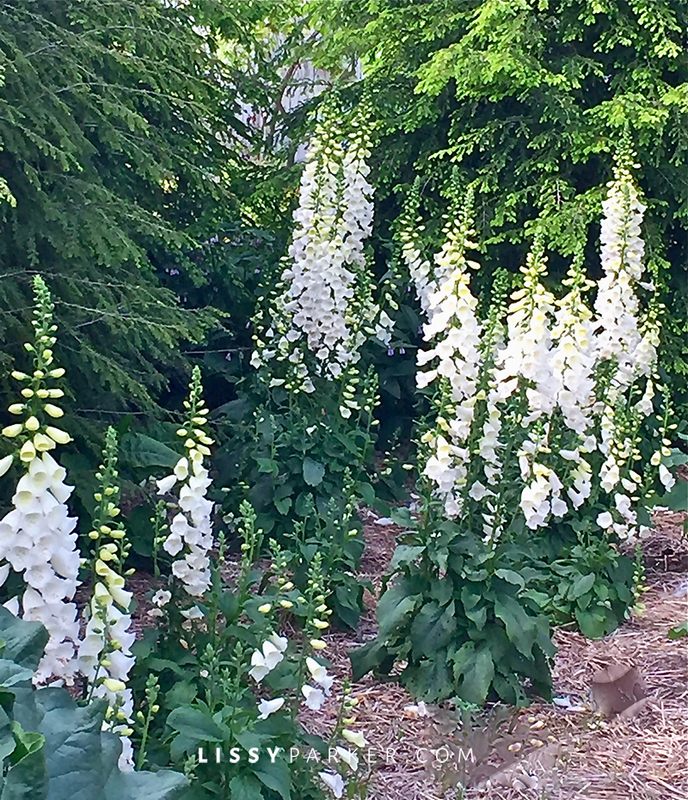 The white foxglove are taking over the corner of the garden.